Glassboro, NJ - Essemtec, a leading manufacturer of surface mount technology (SMT) production equipment, announces that it will showcase flexible Swiss-made solutions in Booth #1617 at the upcoming IPC APEX Expo, scheduled to take place February 28 - March 1, 2012 at the San Diego Convention Center in California. The PANTERA-XV is designed for prototype and mid-size series manufacturing. The machine offers an ideal combination of speed, accuracy and wide application range. The PANTERA-XV is capable of placing 6000 components per hour. The machine features optical laser and vision centring, and can place all SMD components from 0201 up to 2 x 2" (50x50 mm). PANTERA-XVs top-down vision system recognizes fiducial marks automatically. It can be used for teaching and controlling after dispensing and placement. The large feeder capacity and the automatic identification of the intelligent feeders minimize changeover time and guarantee quality. All tape feeders are electrically driven and feeding pitch is programmable. Cobra 8C is equipped with the best that today's drive and material technologies have to offer. Linear motors, a high-speed bus and signal processing system, carbon fiber parts, and a mineral compound base are a selection of the many features that make Cobra fast, reliable and extremely precise. Cobra offers an 8-axes placement head in which each of the axes can place the full range of components that range from 01005 to 3.15 x 2.75" (80x70 mm). Additionally, the system has a capacity of up to 240 feeders with 220 feeders in inline mode. The placement area is specified at 23.6 x 31.5" and placement speed is up to 21,000 cph. 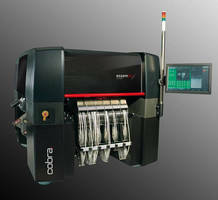 Cobra is the world's first machine that features the Double-Quattro-Pick feature, allowing it to pick four components from four different feeders simultaneously. It is therefore faster than other pick-and-place machines with multi-nozzle pickup head. Cobra is not only fast, but flexible as well. The Paraquda 4C pick-and-place system combines a large feeder capacity, fast programming and changeover while the machine is running, with the ability to quickly place any component from 01005 up to 3.15 x 2.75" (80x70mm) including fine-pitch, BGA, CSP or flip chips. The Paraquda series automatic pick-and-place machines are designed to fulfill the requirements of a high-mix SMT production. All SMD components are placed quickly, and are reproducible and reliable using modern placement technologies. The system features a three-stage conveyor with manual rail adjustment, and a tool changer with 1x36 positions and 14 nozzles. The high-resolution fly-by vision system is equipped with the latest Cognex SMD image processing technology, thus can detect any kind of component - even odd-shaped parts. The Paraquda is operated by ePlace - the new standard in pick-and-place software. ePlace, the new software designed entirely by Essemtec, is based on the company's eez-technology. It has been fully developed in .net, uses an integrated database and offers a modern, interactive, intelligent and intuitive tool for controlling all parameters. Essemtec's Tucano USC-V automatic stencil printer was designed based on experiences from solar wafer printing and metallization. Tucano features a unique design with only one XY-drive for vision, PCB stopper, stencil cleaning system, stencil load and unload, and 2D inspection. The special design increases the reliability of the printer and simplifies maintenance. Additionally, Tucano requires less space than other printers with a 23.9 x 22.8" (608 x 580 mm) printing area on a footprint of only13.99 sq.ft (1.3 m²). It uses less motors than other systems for its operation, and therefore, uses less drive control electronics and energy. Tower is an automatic storage system for SMD reels and trays. The SMD Tower delivers up to 546 SMD reels or trays and requires 8-12 seconds to dispense any component required. The Tower is recommended in low- or high-volume production. Particularly if batch sizes are low and changeovers are very frequent, the automatic storage system saves time and reduces search trouble. The storage system can be expanded with additional Towers at any time. The convenient control software takes over all tasks of storing. The software supervises the stock and ensures the use of the "first in first out" principle. Each component can be assigned to a moisture class (IPC-Standard 033A), and the allowable operation time in a wet surrounding is controlled. The RO300FC-C is a full convection oven that allows fast and homogenous heating, as well as high-temperature soldering of sensitive electronics. As an innovative new feature, RO300FC-C now features RO-CONTROL software for increased process simulation and control. RO-CONTROL combines all the important functions for the process evaluation and process control for reflow ovens. This technologically advanced software offers many of the same features as thermal profilers, but for less than half the price. Also, because the software is within the RO300FC, Essemtec is able to offer users an industry first. Essemtec will also exhibit its newly introduced semiautomatic printer with vision, the Fino that is more than adequate for small to mid-size volumes. Intelligent control and the possibility for an alignment per two vision cameras combines high quality technologies within a small footprint with a 17.7 x 19.7" (450 x 500 mm) printing area. The printer accepts any size stencil frame up to 23 x 23" (584 x 584mm) and offers quick changeover. For more information about Essemtec's flexible production equipment, visit the company in Booth #1617 at the show or on the Web at http://www.essemtec.com/.